Skiing in the Dolomites of Italy offers some of the most impressive scenery of any ski region in the world. It also provides a huge network of connected ski areas, 12 ski regions and 45 villages, with 1,200 kilometers of prepared pistes (groomed trails), impressive lift systems – 450 total chairlifts, cable cars, gondolas and pomas. But most importantly, skiing in Italy is about the lifestyle – sunny slopes in the South Tyrol, stylish and colorful Italian ski outfits, skiing to cozy mountain huts offering delicious alpine food and drink, lodging in beautiful hotels in historic ski villages. Skiing in the Italian Dolomites is different than the Swiss or Austrian Alps, but in a very welcoming way. The mountains aren’t as high or steep, but the scenery is gorgeous and the people are very friendly. Popular family ski resorts in the Dolomiti Super Ski Region are Cortina, Val Gardena, Arabba Marmolada and Alta Badia – all hosts of World Cup ski events. There are also resorts you may never have heard of – Kronplatz, Plose, and Gitschberg and Jochtal– that offer exceptional skiing, both on prepared pistes, with Fun Parks and rodeling (sledding) for kids, and off-piste backcountry terrain which we recommend with a ski guide. Not all the ski resorts are interconnected, but many are. Most of the Dolomite ski terrain is moderately pitched, and well-marked, even though the trail maps can be confusing since these regions are so huge with so many converging ski lifts, and towns and mountain names in both Italian and German. The Tyrolean influence in the Dolomites affects the language, some resorts are Italian while other are German speaking, they even speak an ancient Ladin – but most everyone speaks English as well. You are not skiing to the top of the Dolomite peaks, like you do in the Swiss, French of Austrian Alps. Instead you ski below and around the sharp jagged peaks- providing wonderful scenery but not the full peak to base descent. With skiing typically 1,550 – 3,342-meters (10,964’) at its highest on the Marmolada, the elevation is high enough for good snow, but in general not so high as some Alps and Western US Rocky Mountain resorts that altitude is an issue. The Dolomites tend to be blessed with sunshine given their location in the South Tyrol in north eastern Italy, a part of Austria until the World War. The Dolomites are historic, these jagged towering Dolomite peaks were reefs underwater 250,000 million years ago. Now they soars 2,000-3,000-meters above sea level. The Dolomites were named an official UNESCO World Natural Heritage Site in 2009. The history of skiing in the Dolomites spans over a century, including the first man to ski the Sellaronda in 1912, and the first race from the summit of Marmolada in 1935, the first Italian Winter Olympics in Cortina in 1956, to the joining of the individual ski areas in 1974 to create the Dolomiti Super Ski region all on one interchangeable lift ticket. The name Dolomite comes from the 1789 discovery of geologist Dolomieu, who declared the special dolomite rock. 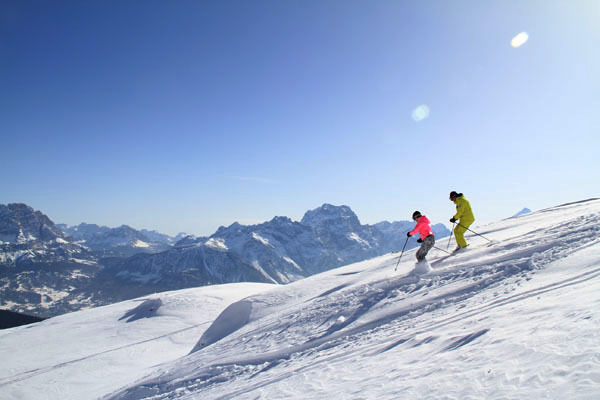 The best interconnected skiing of the Dolomites is at Alta Badia, Arabba, Val Di Fassa – all part of the Sellaronda tour. Val Gardena is also connected and offers beautiful skiing from a stunningly scenic valley. Cortina is a great ski town with three separate ski areas of its own on Tofane, Falloria and Cinque Torri. Other worthwhile skiing areas for a day of skiing in Dolomiti include the 360-degree mountain of Kronplatz, the interconnected Gitschberg and Jochtal and Plose – part of Val Isarca. You can ski the majority of the Dolomite ski region on family ski vacation in a week to ten days, but that won’t leave much time for the Dolce Vita that makes the Italian skiing so special – eating, drinking and socializing while looking incredibly stylish in their ski attire, après ski spa and pool time for the kids, exploring the quaint Italian ski villages and four course dinners each night. The Dolomite ski season ranges from December to early April. The Dolomites can be busy during peak weekends and holidays, like Carnival in March and school holiday in February.